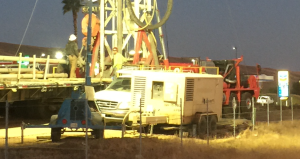 Nor-Cal provides complete well drilling services for domestic and commercial uses. Well diameters can range from 4 inch to 24 inch casing, with depths from 100 feet to 3000 feet. Establishment of local geology and sustainability of the water levels. Drilling to the correct depth to sustainable water levels. Installation of permanent well casing. Test pump and development services. Installation of the correct pump, depending on the capacity required. Provision of all laboratory tests and results for the water supply. Installation of a filtration system if required. Provision and installation of tank storage systems as required. Nor-Cal rigs can drill water well boreholes for a broad range of applications, from standard domestic wells to larger commercial installations. We have rigs available to deal with all the different ground conditions that are encountered. Domestic water wells can range from a single dwelling upwards. Commercial water wells can range from a small factory to large rural farm or golf course. All water well boreholes should be tested before they are used for drinking purposes. At Nor-Cal we offer a complete testing and laboratory service. Depending on the requirements of the water well, we can provide and install a complete range of storage systems. With certain types of storage system we can achieve a full gravity feed water system.